This is the saddest thing ever to happen at the Happiest Place on Earth. According to an expose in the New York Post, some wealthy families are hiring handicapped people to pose as relatives and accompany their children through Disney theme parks- so they can enjoy line-skipping privileges! Disney parks allow wheelchair-bound guests- along with up to six companions- to bypass long lines and use more convenient entrances. Anyone with the money to burn can get a legitimate fast pass through the park’s official VIP tour service which lets them jump the lines ($310-$380 per hour). But in-the-know moms say the “black market” handicapped guides are a better deal at $130 per hour or $1,040 per day. It’s a sad world after all. 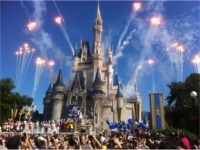 What do you think of rich families hiring handicapped people to help their kids skip the lines at Disney? Should the park crack down on this practice? Click here to read more!